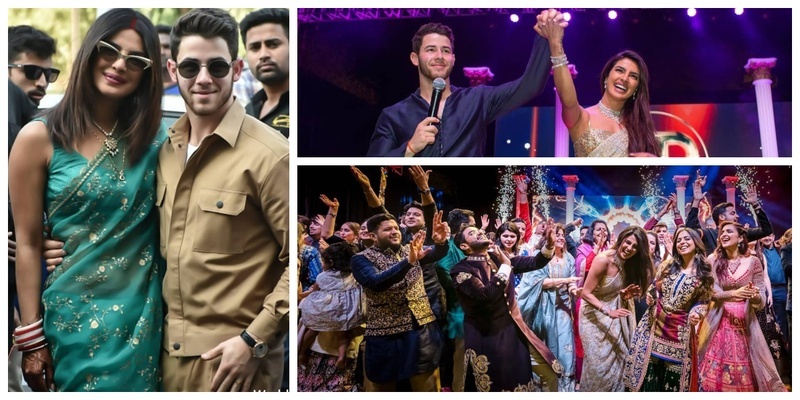 After a Sangeet Night which was nothing short of a concert itself, here's the first look of Priyanka Chopra and Nick Jonas as a married couple! Priyanka’s cousin Parineeti Chopra gave a solo dance performance at the sangeet. Totally loving how she is seen hoisted on a boat with wind blowing in her hair. Are they re-enacting the Titanic? Pictures from the sangeet ceremony show the Ambani family to be sitting in the front seats with the bride, groom, and their families and from the looks of it, they had a BLAST. Sophie Turner - Priyanka’s to-be sister-in-law wore a red lehenga and was seen making some killer moves in one of the pictures from the sangeet. The video also saw Priyanka dancing with her mother on stage and it literally was too cute to handle! Totally digging Madhu Chopra’s dazzling blue saree. "It all began as a fierce song & dance competition between the families but ended, as always, as a huge celebration of love. Nick and I were looking forward to the Sangeet (musical evening), another pre-wedding ritual.. and to see what each side had put together. And what a performance it was. Each family telling our stories through song and dance, filled with lots of laughter and love. We were both filled with gratitude for the effort, the love, and the laughter and will carry the memories of this special evening for the rest of our lives. It is an amazing start to a lifetime of togetherness for our families and friends.. #grateful"
Reports go by after the whole shenanigans ended, Mama Jonas - Denise gifted her daughter-in-law a pair of earrings worth $ 79,500, that's about Rs. 56 Lakh. The jewels are reportedly absolutely stunning and are designed by well-renowned luxury jewellery designer, Van Cleef & Arpels. These Snowflake earrings, as they're called, weigh about 6.7 carats and are made up of 170 stones. Well well, share the wedding pictures already #Nickyanka!